We have new orders from M to make contact with special guest Bob Chipman and discuss From Russia With Love, the second James Bond film. 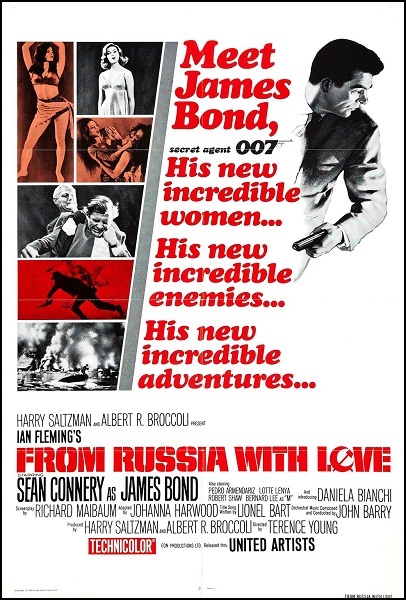 We'll talk about the film's reputation as one of the best of the Bond films, examine the movie's place in the evolution of the 007 franchise, and keep track of the series' racism, sexism, homophobia, and articles of clothing that Bond has people fetch for him. Warning: Contains explicit language, spoilers, and a totally gratuitous Romani wrestling match. Have your own island-based training camp you'd like to brag about? Do you have a match or do you prefer a lighter (until they go wrong)? Want kind of wine do you drink with fish? Leave a comment and keep the conversation going.